Have you ever driven down a major city thoroughfare that has timed traffic lights? If you get a green light at the start, and then drive the right speed you will sail down the street without ever having to stop. The opposite is also true. 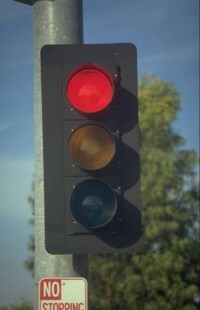 Hit one red light in the beginning, and you will be stopped at every intersection for the duration. It can be mighty frustrating. That experience is similar to what eventually happens to anyone who prays. They may sail along for a good long while, and all their prayers are answered. But then they hit on a red light and are stopped dead in their tracks. No answers. After hitting a few more red lights, frustration, doubt and discouragement set in. You may be stuck at a stop light right now. Don’t despair; the light will turn green again, but in the meanwhile, let’s look at the roots of unanswered prayer. Prayer is not answered for three main reasons: God – his timing and his sovereignty; Satan – his blocking and demonic influence; and ourselves. Part of what we can do when we are stopped at the red light is to try to use the time to develop some spiritual perception. We need to discern with spiritual eyes and ears what is really going on. Then we can adjust our prayer accordingly; in some cases we can force the light to go green again. Ecclesiastes 3:1 says; “To everything there is a season, a time for every purpose under heaven.” One of the things I have noticed about God over the years is that he is a God of economy, and he often masterminds blessings and answers in a way that affects multiple people and situations. He may wait to answer a prayer so that when the answer comes it is even better and more influential than what was originally asked. An example from scripture was when Hannah, who was barren, prayed for a son. She got her answer – though delayed, when God gave her Samuel, but the timing was such that Israel also got a great Prophet, and a man who transitioned the country from being governed by Judges to Kings. When we are in the prayer arena we also have to consider God’s sovereignty which means his absolute and supreme authority to do whatever he chooses, whenever he chooses to do it. For instance, God created the heavens and the earth by his own sovereignty; no one prayed that he would do so because no one existed. Certain things are set by God’s own authority. The timing of the coming of Jesus to the earth was set by God. The scripture says he came; “in the fullness of time” (Galatians 4:4). No one could have changed that, and no one can change the timing of the Second Coming of Christ. It will happen right on schedule. Scripture makes us very aware of the fact that Satan, the devil, is active and operational in our world today. One of his chief activities is stealing from us. Jesus said this about the devil’s purpose; “The thief comes only to steal and kill and destroy” (John 10:10). If he can, he will steal our blessings, our abundant life, our dreams, AND our prayers. Satan has authority in the worldly realm. When Jesus was being tempted after a forty day fast; “The devil led him up to a high place and showed him in an instant all the kingdoms of the world. And he said to him, ‘I will give you all their authority and splendor, for it has been given to me, and I can give it to anyone I want to. So if you worship me, it will all be yours'” (Luke 4:5-7). Under Satan’s command there is a hierarchy of evil beings assigned both to territories and to people carrying out his orders all over the world. An example in scripture of prayers blocked by demonic spirits is given in Daniel 10. Daniel had been praying for 21 days when he received an angelic visitation. The angel told him that his prayers were heard from the first day he prayed, but the demonic spirit that controlled Persia was preventing him from coming to answer Daniel. During this time, help was solicited from Michael, the guardian angel of Israel and a heavenly battle ensued to clear the blockage. The good news for Christians is that our authority through the name of Jesus is greater than the power of Satan. Luke 10:19 says; “I have given you authority to trample on snakes and scorpions and to overcome all the power of the enemy; nothing will harm you.” If we are sitting at a stop light because of demonic activity it is possible to clear the blockages through spiritual warfare which may include fasting, heightened intercession and taking authority over Satan in the name of Jesus. If this is the case, the light can now turn green, and on we go. This is the area where we have the most control to turn our STOP light into a green light. I also know from my own experience it is sometimes the last place we want to look when evaluating why our prayers are going unanswered. We can either choose to ignore the part we play in unanswered prayer or examine and correct our heart, and then receive our answers. Actually, if we aren’t willing to correct the problem, why bother praying at all? Here are some things that can block answers to our prayers. “And when you stand praying, if you hold anything against anyone, forgive him, so that your Father in heaven may forgive you your sins” (Mark 11:25). We can actually prevent our own sins from being forgiven by refusing to forgive others. “If I regard (meaning cherish) iniquity in my heart, the Lord will not hear” (Psalm 66:18). Sin can close down the communication lines between us and God. “You do not have, because you do not ask God. When you ask, you do not receive, because you ask with wrong motives, that you may spend what you get on your pleasures” (James 4:2-3). This does not mean we cannot ask for our personal needs, but we do need to examine our deepest motivations in our requests and dig out and repent of selfishness and greed. “This is the confidence we have in approaching God: that if we ask anything according to his will, he hears us. And if we know that he hears us – whatever we ask – we know that we have what we asked of him” (I John 5:14-15). We can save ourselves a lot of grief by getting God’s heart on a matter before launching a doomed prayer initiative. “Husbands, in the same way be considerate as you live with your wives, and treat them with respect as the weaker partner and as heirs with you of the gracious gift of life, so that nothing will hinder your prayers” (I Peter 3:7). Relationships out of whack can hinder prayers, and this does not just apply to husbands. The principle is lack of respect. “But when he asks, he must believe and not doubt, because he who doubts is like a wave of the sea, blown and tossed by the wind. That man should not think he will receive anything from the Lord; he is a double-minded man, unstable in all he does” (James 1:8). Asking clear specific stable prayers will yield results in opposition to the kind of prayer referenced here by a double-minded person. If you are currently sitting at a STOP light, and have been there too long, you might want to use the time to find out why the light won’t change. Is it God and his timing? Is it Satan? Is it something on your end? Take some time to pray specifically about discerning the hold up. To clear the air you might want to fast (See “Clearing the Fog” for more information on Fasting). BUT, no matter what is going on or how long it takes, KEEP ON PRAYING. Do not give up. Prayer makes a difference, and God answers prayer! AMEN!